Frog season is sort of just around the corner. I like frogs, particularly their voices. Recent research into a growing decline in insect populations brought the frogs to mind. Frogs eat insects. We have frogs in the swampy pond behind our house. I identify them by their voices. I’ve heard seven different species out there. That number is shrinking. This year I counted five. 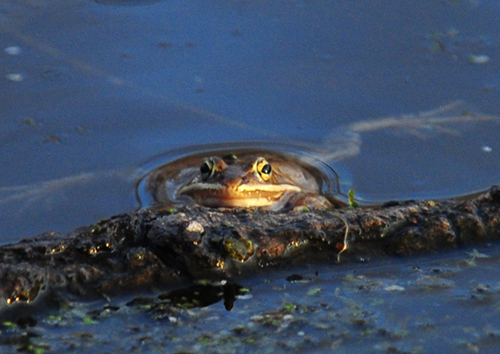 The pond frogs are of interest to more animals than me. Our frog population feeds Green Herons and Broad-winged Hawks. A Green Heron spent the daylight hours of Oct. 15-18 catching frogs in the pond, fueling for migration I suppose. One of those days it was here from 10 in the morning until dusk. Each spring the Metropolitan Mosquito Control District flies a helicopter over the pond to drop chemical pellets that kill mosquito larvae. It works well. Perhaps too well for frogs and birds. Larvae are food for other creatures in and of the pond. Is a steep drop in larvae numbers contributing to a loss of frogs? Will the herons figure this out, and find other places to feed? We make wild life complicated.